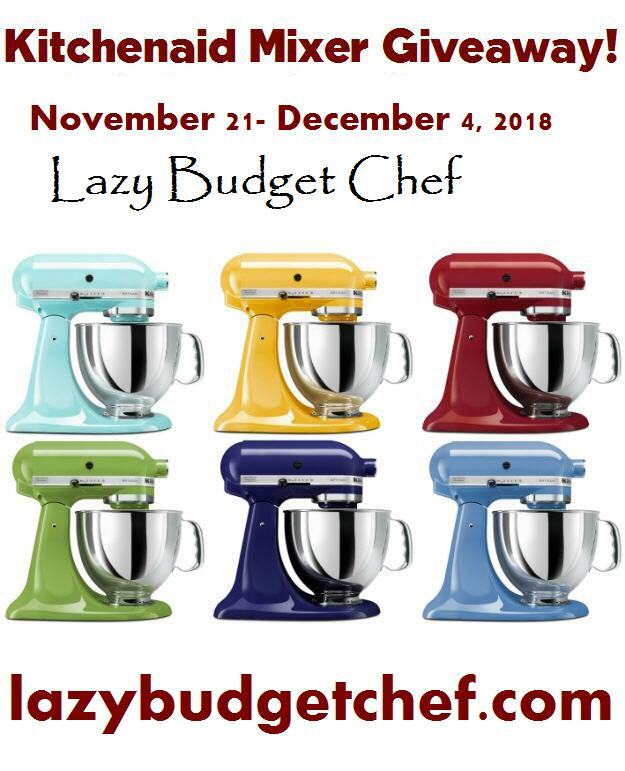 Lazy Budget Chef: KitchenAid Artisan Stand Mixer Giveaway! KitchenAid Artisan Stand Mixer Giveaway! People consider November and December the season of Giving. Because I’m so glad you’re here and reading my blog, I wanted to show you my appreciation with this KitchenAid Mixer Giveaway! I'm giving YOU the chance to WIN a super fabulous KITCHENAID STAND MIXER!! is stand mixer is a beauty, combining professional functionality with a silhouette. The mixer’s rugged, all-metal construction ensures durability and quiet operation, while the tilt-head allows for easy access to the bowl and attachments (beater, wire whisk and dough hook). Just think of all of the deliciousness you could make this with gem! This giveaway is open WORLDWIDE to reflex my most amazing blog community that spans the globe and ends on December 4, 2018 at 11:59 PM Eastern Standard Time. Use the Rafflecopter widget below to ENTER NOW!